Last weekend, I completed the Divas DC Half Marathon in Leesburg, VA. This post will recap the expo- look for a race recap post later this week! 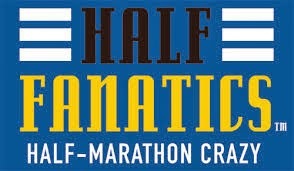 As you might know, my friend Jen and I were doing this half marathon together to celebrate her 30th birthday. This race was about an hour and 45 minutes from us. We left around 3 pm on Friday afternoon so we'd get to the expo with plenty of time to shop. 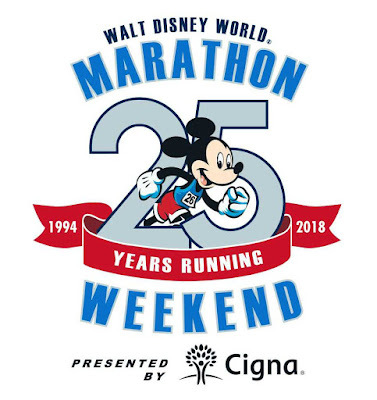 The expo, affectionately called the "Diva's Health and Fitness Boutique," was held about 15 miles from the start of the race at Lansdowne Resort. We couldn't park at the resort because they were holding the 5k on-property at 6:15 pm. So they directed us to a lot in the nearby business park. This is an important detail- we'll come back to it. After parking, it was a little confusing as to where the expo actually was. We asked a group of women where the expo was and they explained we needed to follow "the path." Eventually we found it and hiked over to the expo. Once we entered the resort lobby, there was plenty of signage to help us find the pink explosion expo. Then we headed over to pick up our VIP parking pass. 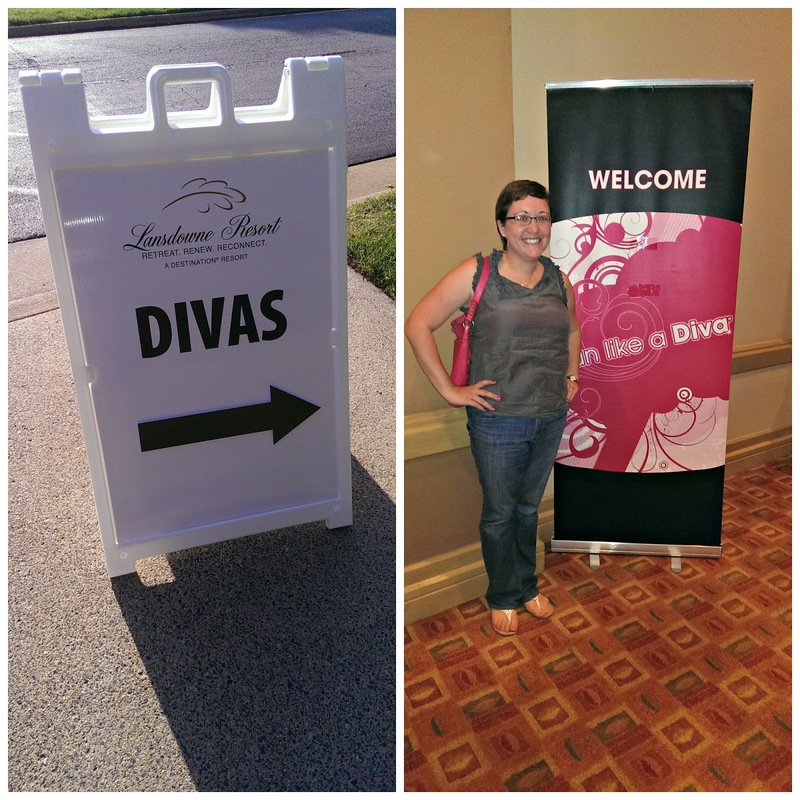 Because the starting line of the race was at a rural vineyard, the Divas organization had different shuttles and off-site parking lots available for runners and spectators to use. Last year, parking was one of the biggest issues that lead to an almost two hour delay in the race start. There was only one road that leads to the vineyard so you can imagine the back up caused by 3,000 runners. So this year they implemented off-site parking and shuttles. However, you could purchase VIP parking and park directly at the vineyard. Since this was a new race for us and I didn't want any parking stress on Saturday morning, we opted for the VIP pass. Which meant no line for us! There was a crazy-long line for the shuttle option- I guess you had to choose an off-site parking lot and shuttle at the expo. For VIP, they gave us a hang-tag for the rear-view mirror and detailed instructions on how to get to the vineyard. Right after we grabbed our parking pass, I heard someone behind me asking if I was sparkly runner. It was Donna- a friend from instagram and twitter! She recognized my Enell Ambassador shirt and decided to say hi- and I'm so glad she did! 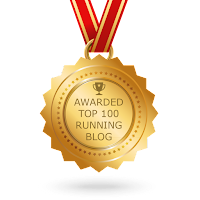 That's the one thing that I absolutely LOVE about the running community and social media; I've been able to meet the coolest people. After a quick chat with Donna, Jen and I started making our way through the vendors. I was slightly disappointed with the amount of vendors. With this being a women's focused race, I expected more vendors- especially those that cater to women. But some of my favorites were there- Hippie Runner, Bee Cause Charms, Bay Six, and York Sign Shop- if you ever need an affordable, high-quality medal holder, be sure to check them out! Jen bought a few shirts, we bought some distance charms for our shoes- 13.1 for Jen, 39.3 for me, and we both picked up a belt from Hippie Runner. Luckily for my wallet, we got out of there without spending a tremendous amount of money. As we left the expo, the 5k was starting so we were able to see the front runners at the first water station. Then we realized that we had no idea where we parked. All the buildings and parking lots in the business park looked the same and nothing looked familiar. Thankfully, we eventually found the car. From the expo, we needed to make one more pit stop before getting to the hotel. Since I have been losing weight, I needed a smaller Enell sports bra. Unfortunately, there isn't a place near where I live that carries Enell products. But I used the store locator on Enell's website and found a place in downtown Leesburg just a few miles from our hotel. We made a quick stop at Potomac River Running Store and I picked up a brand new Enell in black. I was also able to see the new Scuba Duba Blue and let me tell you, it is so gorgeous! 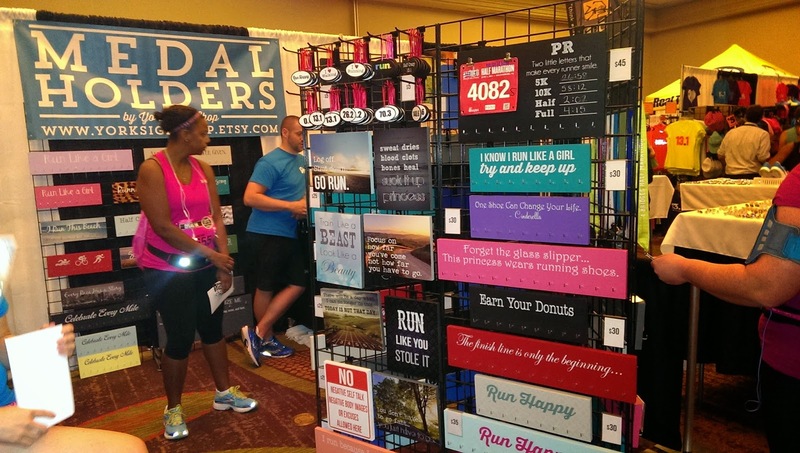 This swanky running store uses monogrammed wooden hangers. Fancy. From there, Jen and I grabbed a carb-o-licious dinner at a local irish pub-type restaurant. Then it was off to the hotel to get prepped for the race and to get some sleep. After all, we had 13.1 miles to chase in the morning! 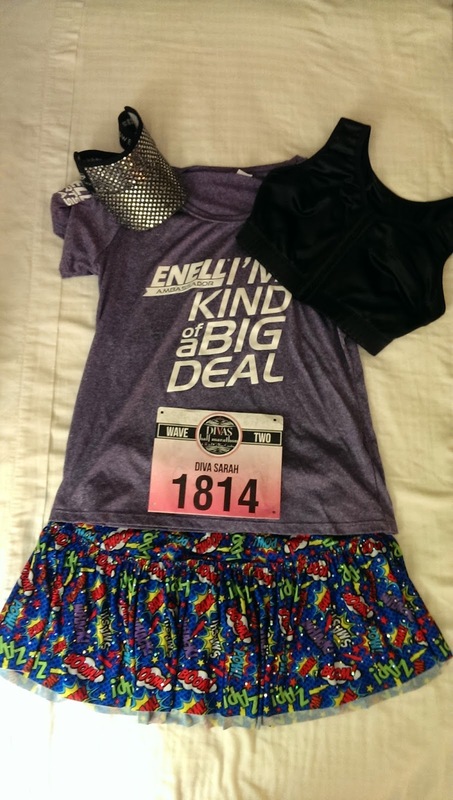 New Enell + new Sparkle Athletic skirt = Diva ready. QOTD: What's your favorite part of a race expo? Yay for smaller sizes! 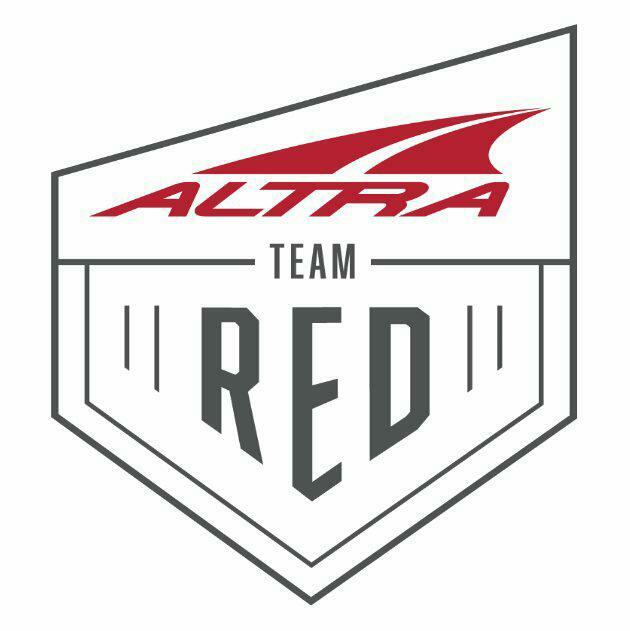 :-) Looking forward to the race recap. Congrats on loosing enough weight that you needed a new sports bra! I didn't realize that PRR carried Enell bras. I love that store, and their races are some of my favorites (they're the organizer behind Saturday's Dulles Day 5k/10k). I'll definitely have to stop there and try out an Enell bra and compare it to the Champion ones I've been wearing. I love race expos, but I've done so many now that it seems like it's always the same vendors. I was disappointed in Disneyland this year. I wasn't running it, but I headed over specifically to sign up for some local races that always have tables there, and there were no other race organizations. I guess since DL now has a full calendar of their own races, they don't want competition from anyone else. Wow! They always used to have other races! That's crazy. 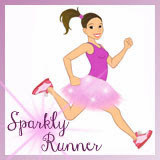 Our Divas race expo in North Myrtle Beach was much bigger this year than last year and they had some great stuff including Sparkle Athletic and Sparkle Skirts. I can't wait to hear all about your race! Yeah, I'm thinking because this one was smaller- only about 2,700 runners- they didn't have the draw of some of the bigger vendors. I would have LOVED to see Sparkle Athletic or Sparkle Skirts there.